YARA Birkeland is a new emission-free, autonomous container vessel under development. A graphical image showing the side profile of the vessel. The autonomous vessel will be powered by an electric propulsion system. The ship has been named after Yara’s founder Kristian Birkeland and will be the world’s first fully electric and autonomous container vessel upon completion. YARA and Kongsberg initially entered a partnership to construct the autonomous container feeder ship in May 2017. Kongsberg is responsible for the development, supply and integration of sensors, electric-drive, battery and propulsion control systems under the agreement. YARA Birkeland will enter service as a manned vessel in 2018 and will commence remote operation in 2019. The vessel’s fully autonomous marine transport operations are slated to begin in 2020. It will operate on a sea route between Brevik, Herøya and Larvik ports in southern Norway. The entire route is covered by the Norwegian Coastal Administration’s (NCA) Brevik Vessel Traffic Service (VTS) centre. 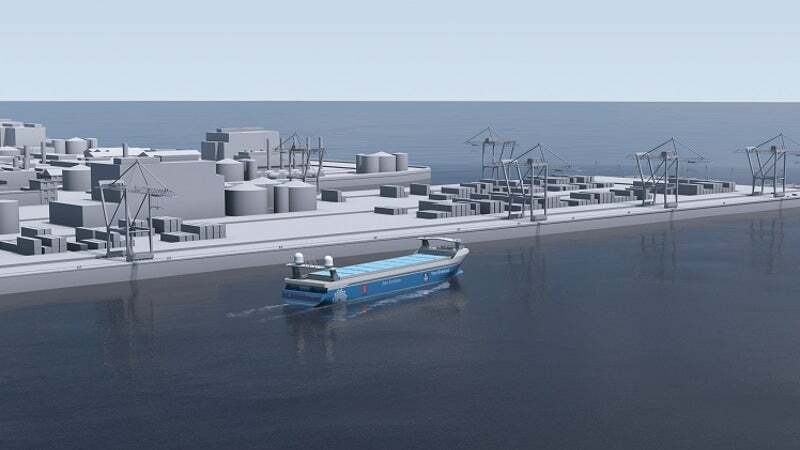 The cutting-edge vessel will avoid 40,000 road trips from Yara’s Porsgrunn fertiliser plant to the ports of Brevik and Larvik, while reducing the level of NOx and CO2 gasses emitted by haulage trucks. YARA Birkeland is being designed by Marin Teknikk, while SINTEF Ocean is responsible for its testing. DNV GL is expected to assist in the certification process and Norwegian maritime authorities will ensure the implementation of the relevant rules and regulations. The autonomous container ship will demonstrate innovative maritime technologies to enable green shipping operations. It will have an overall length of 79.5m, a moulded width of 14.8m, a depth of 10.8m and full draught of 5m. The deadweight of the zero-emission vessel will be around 3,200t. YARA Birkeland will feature an automatic mooring system that will require no special preparations at docks to enable autonomous berthing and unberthing. The final design of the 2.4t scale model was revealed in September 2017. The contract for the vessel’s construction is expected by the end of 2017. Norwegian Ministry of Petroleum and Energy-owned company ENOVA announced a funding grant of $16.7m to support the construction of Yara Birkeland in September 2017. The vessel is scheduled to be delivered by the shipyard in the second half of 2018. It will be installed with a containerised bridge featuring crew facilities for trails in the third quarter of 2018. The remote control tests will be conducted in 2019. The bridge module will be removed once the ship is equipped for autonomous operations in 2020. YARA Birkeland’s communication systems will comprise a maritime broadband radio and a virtual private network (VPN) connection through Inmarsat. YARA Birkeland will feature a large open cargo to accommodate containers featuring up to 120 twenty-foot container unit (TEU) capacities. The cargo loading and offloading will be performed automatically via electric cranes and related equipment. The vessel’s battery pack will act as permanent ballast, eliminating the need for installation of dedicated ballast tanks. The zero-emission vessel will be equipped with an electric propulsion system powered by a battery pack with a capacity of up to 9MWh. The propulsion system will integrate two azimuth propeller pods and two tunnel thrusters. It will provide a service speed of 6k and maximum speed of 10k. The ship will be monitored and controlled from three operation / control centres, which will handle emergency and exception handling, observation of conditions, operational monitoring and decision support. The centres are also expected to manage the surveillance of the autonomous vessel and its surroundings, as well as various safety aspects.